I find out how to avoid the Battle of Britain, during the Battle of Britain! I remember reading somewhere that you don’t remember pain. 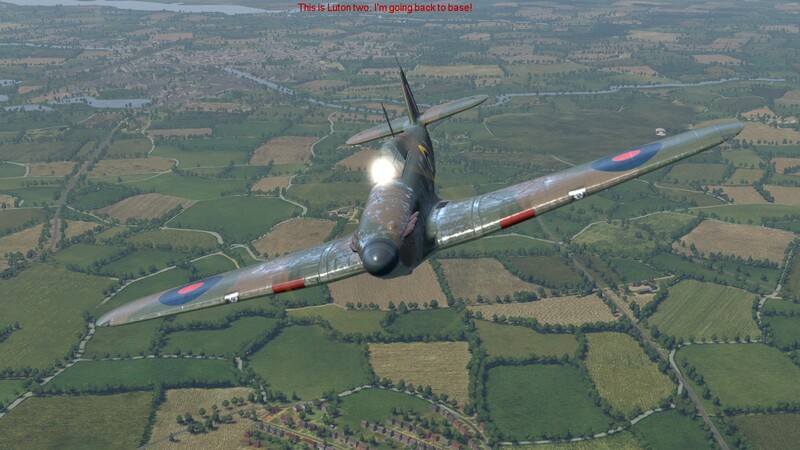 That’s maybe why I go back to playing Cliffs of Dover Blitz Edition, every so often. This mission report is from my most recent such foray…or should that be, ‘relapse’? Why do I find playing CloD painful? In short, because I’m single-player only. The longer version is that while the planes and sounds are very good indeed, the SP missions and campaigns mostly aren’t; the AI definitely isn’t; the radio traffic is overwhelmed with pointless drivel; the scale of operations is small; the command and comms menu is mostly broken; and other features like anti-aliasing and labels are badly implemented. What hurts most is how good CloD would have been, had less been broken or badly executed. If it’s like this now, after several Team Fusion upgrades, it must have been rather dire upon release. 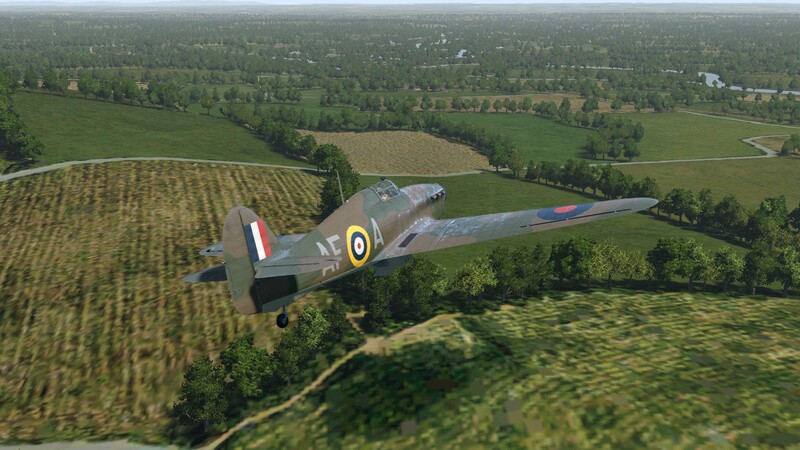 This sortie is from the RAF Redux campaign. The latter replaces the stock RAF campaign’s creative but unconvincing briefings with new backstory and briefings based on the Battle of Britain career of a real US pilot, CW ‘Red’ McColpin. 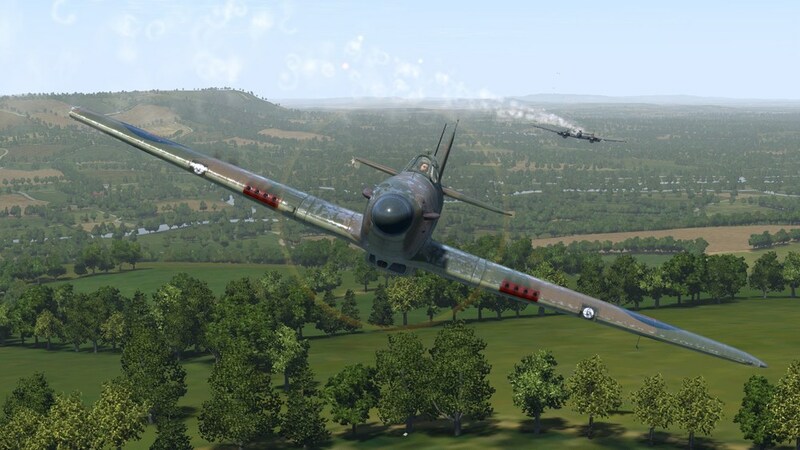 The missions seem to be tweaked versions of the stock campaign’s – for example the first mission in both is an exciting take off while your airfield is being raided by a bunch of Dorniers, coming in low. The missions are scripted, not dynamic in any sense I can see, and I think play out the same each time. It’s 17th August and I’m maybe a third of the way through the campaign. This is the point the player is transferred from 607 Squadron flying Hurricanes and Tangmere - or should that be nearby Westhampnett? - to a Spitfire outfit, 602, based a lot further east, at Manston. The Redux briefing gives me a much more friendly send-off, with a feel for authentic period/RAF dialogue that’s entirely missing in the original. My old CO is flying as my number 2 on this transit flight, as he wants to speak to my new boss. In person. Bit weird, that, especially at the height of a major air battle. Like the stock mission, the briefing insists I take a longer, indirect route along the coast. This also is a bit weird, but from past plays, it seems certain triggers won’t work, if you pick a sensible cross-country route. Climbing to 20,000 feet as the briefing instructs seems designed to waste even more valuable petrol. Anyway off I go, the mission starting as usual lined up for take-off, engine running, but reflector sight needing turned on. My Hurricane has the correct codes for 607 Squadron - AF - not the ‘FC for Fat Cats’ of the stock version. Sadly, my last campaign flight in this type of aircraft uses one of the kites whose rigger has been busy with a sanding block, trying to remove the paint from all metal surfaces, sticking at it just long enough to make a mess. I think I'm Luton 1, and the boss, soon to be my ex-boss, is Luton 2, telling me he's ready to go. The radio voice procedure here seems quite authentic - it's when people start spouting guff like 'I've got your six!' - usually six or so at a time - that CloD's R/T chatter goes down the (toilet) pan. Despite being billed as Tangmere by CloD, the lack of paved runways and its location suggest this is the satellite airfield at Westhampnett. Except that this CloD version has proper hangars, which my main source ('Airfields of the Battle of Britain' by Philip Birtles) says were just 'blister' hangars in 1940, with tents being replaced by Nissen (corrugated iron) Huts for accommodation as the Battle progressed. Taking off to the south, I throttle back and orbit, for the boss is in no hurry to join me. In the pic below you can see the mission messages displayed in Redux campaign missions. How is it that we have a loss already, you may ask? Well, instead of the boss joining me, three Hurricanes approach from the coast and get in the way. The Redux mission messages display things like 'British down’, apparently triggered when the incoming Hurricanes crash one after another, for no apparent reason. The first prang presumably accounts for the read-out seen in the pic above. Later – though not seen on this play through – you may see several Wellington bombers floating past. Some or all of these too come a cropper. Again, not through enemy action I think, though it’s hard to tell. I have aircraft icons turned off in the 2d map, and it seems to ignore any effort I make to turn them back on, or display routes or anything else that you can supposedly toggle on or off. And you cannot readily turn aircraft labels on or off in the 3d world. My experience is that CloD’s general level of user-friendliness is at or around ‘cornered rat’. The next message, top centre of the pic below, seems to be the boss telling me he's had enough of this already. I'm not surprised, with kamikaze Hurricanes all around. Of maybe the Station Commander has stepped in and cancelled his 'jolly' to Manston; if so, very sensibly in my opinion. Squadron leaders should have better things to do in wartime. I get tired waiting for the boss and climb parallel to the coast but slightly inland, levelling off at about 5-6,000 feet. The more I look at this next pic, the more convinced I am that the airfield I've just left behind is Westhampnett (now Goodwood airfield and motor racing circuit) not Tangmere, the location in relation to the town which looks like Chichester being another clue. Or perhaps it IS Tangmere, minus paved runways, and Westhampnett is the grassy area visible above the roundel on my raised wing. Still climbing, I fly over what may or may not be the real Tangmere. Birtles' book says its paved runways were completed in 1939, although the location and number of hangars visible below doesn't match the book's description. After a while I see a pixelated aircraft ahead, slightly right and a bit higher. He’s flying level and away from me on a similar course. Catching up, I see it’s a Hurricane – the boss, it must be, although he’s supposed to be flying as my number 2. Besides which, didn't he tell me not ten minutes ago that he was going home? Seemingly, turning on autopilot is one way to keep things relatively sane in CloD, although while active it turns your flight sim into a movie. Before I can get close, the boss announces on the R/T that he’s spotted enemy fighters and whizzes off to the left, across my nose. Following him, I see nothing. Then looking the other way, I see two indistinct aircraft manoeuvring to my right, slightly higher and moving fast. These must be the 109s. I turn after the second one. 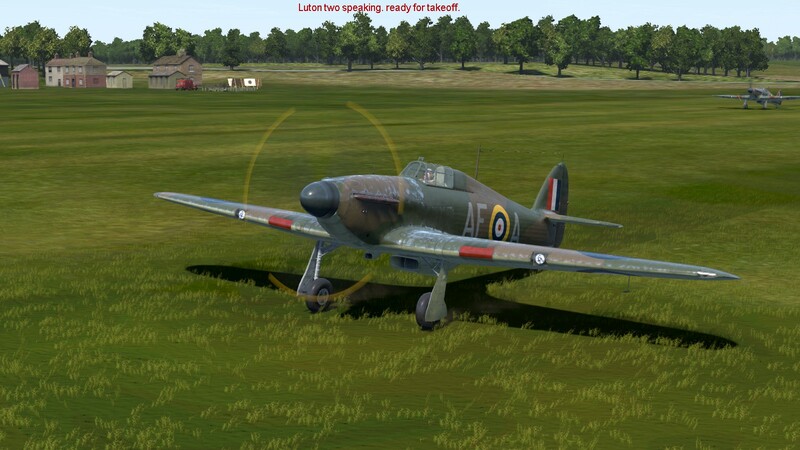 In CloD, unlike BoB2, you have to turn on ‘complex engine management’ to get the negative-G cut-out with the British Merlins and although my Hurricane has a constant speed prop which needs less manual intervention, I’m sure I’m not making the best use of the available settings. The 109 seems to be able to run rings around me, even allowing for him being faster to begin with. 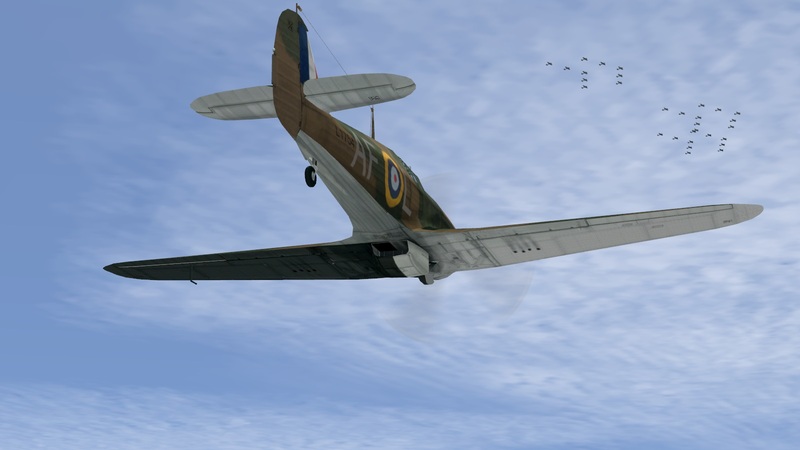 The dogfight which follows sees me chasing and losing one aircraft after another, including a Hurricane at one point. It’s moderately exciting, especially when twice, a 109 on which I’m trying to get what these days would be called a firing solution turns into me and we go head on. Both times we seem sure to collide; both times I scrape by, the second time taking some hits, cannon shells to a wingtip as I later discover. In return, I manage to get hits on a 109, who trails light smoke but refuses to slow down. No matter if I cut across his corners, or his dips and climbs. And CloD’s Messerschmitts jink a lot, when chased; the rate at which they can reverse a roll seems rather high, and they don’t seem to lose much speed. Oh and don't ask why somebody is on the squadron radio net giving headings and heights, in the middle of a dogfight - I have no idea. I can’t close the range to the smoking, speeding 109, whatever he does. I try a few rather optimistic, longish-range deflection shots in an effort to slow him down, but lose him somewhere below when he turns underneath me and away. Still smoking. Still speeding. Suddenly, I get a shock. A dense stream of tracer flies over the top of my canopy. The next pic is from a different mission - when I was flying the Messerschmitt - but I've included it since it illustrates neatly what happened to me. I break hard, of course. Coming out of the turn, I can see the fight has been joined by two twin-engined Messerschmitt 110s. I turn in after the nearest one and off he goes, round and round, up and down, like a circular roller-coaster, except for the jinks. As he’s bigger and slower than a 109, I manage to stay with him, keeping an eye open for the other Messerschmitts, whom I don’t see again. I get some hits but it’s no surprise when I run out of ammo. By this time, we are a few miles inland, with low rolling hills below. I break off and dive to ground level, heading east towards Manston, dipping into valleys and over tree-covered hills, changing course every few seconds until I’m fairly sure I’m in the clear. I didn't get any pics of the 110s, but I'm sure you'll take my word for it. The next two pics are me after breaking off, legging it at low level for my new home at Manston. The 110 doesn’t come after me; I fact I don’t see him again, either. Every so often I see R/T messages displayed (which you can barely hear, even at the highest volume setting); these seem to be my boss calling out courses and heights, although he’s supposed to be flying on my wing. One of the Redux mission messages tells me I have been credited with a victory. It looks like that damaged 109 didn’t make it, although he was whizzing all over the place quite merrily, the last time I saw him. 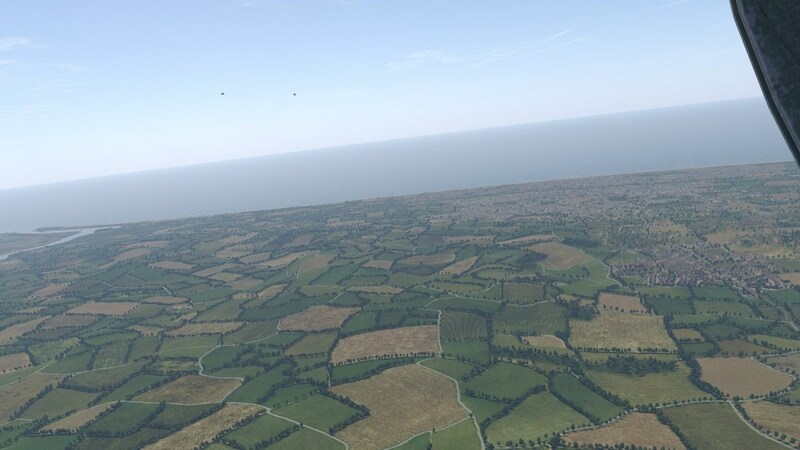 Feeling more confident, I climb to a few thousand feet and adjust my course the better to reach Manston. It’s about this time I notice the holes in my port wingtip. Everything seems to be working normally and I throttle back to cruising speed or thereabouts. From higher up I can see further and orient myself a bit better. Which is just as well as I can’t seem to turn on icons or courses on the mini-map, even before the mission. Manston is practically on the east coast, on a headland at the southern end of the Thames Estuary. So it’s a long and rather dull cross-country flight from here on in. I relieve the boredom using time acceleration, until I reach Canterbury, at which point I drop back into sight-seeing mode - note the town's cathedral. One sight I don’t see is the boss. Losing height, I come in south of Manston’s grass east-west landing strip and see an aircraft slipping in from the opposite direction, off to my nose to the left. Looks like the boss, joining the circuit. I request permission to land – one of the few comms menu options which actually works – and am denied. I decide to mis-hear this – the circuit is not exactly busy. At about this point, I get a sim text warning that I have a hydraulic failure. 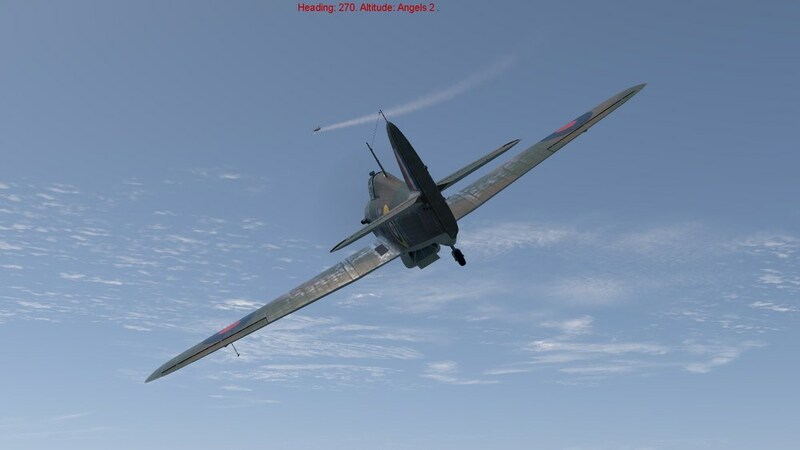 This seems a bit steep, as I have no visible damage other than in my left wingtip. I make a curved approach to land from east to west but it's now no surprise that I can’t lower either flaps or undercarriage. I think that there is a key to drop the gear manually, like in BoB2, but I can’t recall (a) what it is and (b) whether I set it in the options menu – you have to set just about everything here, for anything to work. More of that cornered rat user-friendliness. Consequently, my arrival at my new base is a bit undignified. Just to rub it in, the boss comes in from the opposite direction and makes a perfect landing, as I sit there, surveying the damage. Happily I have slid off to one side of the grass landing strip and he passes me by without adding to the wreckage. Just before he had done so, I had noticed the Ack Ack gun near the end of the runway, firing. That reminded me that I had, shortly before, heard a report of Dorniers. Scanning the skies now from my cockpit, I can see neither aircraft nor Ack Ack bursts, and the shooting from that gun up ahead seems to have stopped. False alarm? Meantime, a game message has told me that I have completed the mission – the sole objective was to reach Manston – so I let it go at that. The statistical debriefing - which seems to cover all casualties during the mission - records several Hurricanes and Wellingtons lost, few if any due to enemy action, as far as I could make out. It also confirms my Messerschmitt was shot down. So it wasn’t all bad. But it felt a bit incoherent and aimless on the one hand, and scripted - positively on rails - on the other, with those 109s and 110s serving no other purpose than to entertain me en route. Provided I too stayed on the appointed rails. 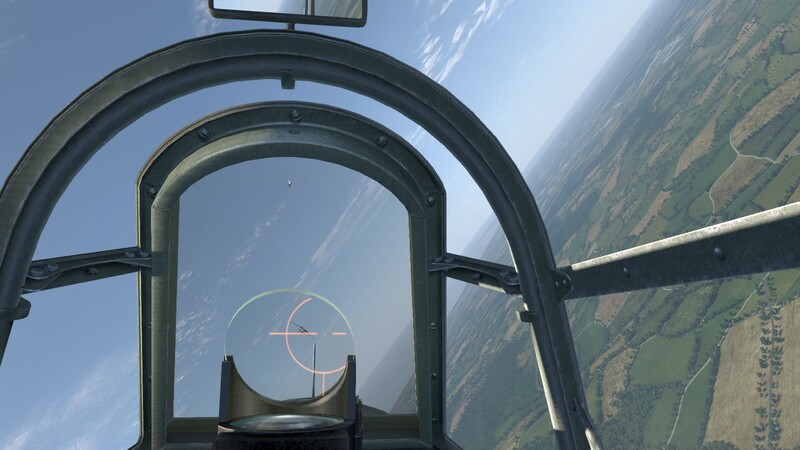 In real life, at this point in the Battle, the Luftwaffe was using every opportunity to hammer RAF airbases, not sending pairs of fighters over the Channel at low-ish level. Any fighters who were on their way home would not have been flying in pairs if they could possibly have avoided it, and would not likely have stayed to mix it with an RAF fighter they weren't able to hit-and-run. The RAF Redux campaign conveys some sense of the real battle via debrief text panels which quote Churchill and/or sum up the day’s operations, though for all I have seen so far, I might as well be reading the newspapers from somewhere well away from the action. 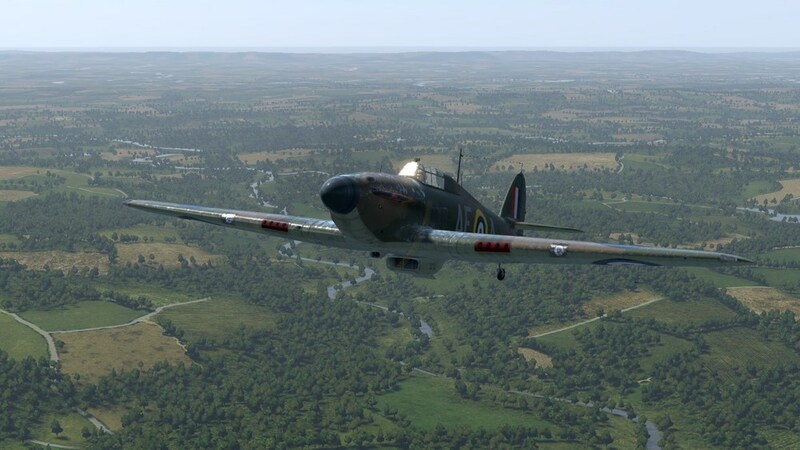 There’s a few mission sets available over at the ATAG forums which may do better in creating a better sense of scale; perhaps some RAF Redux missions do so too, we shall see. But not just yet. I knew before I bought it that CloD wasn’t rated highly as a sim for Single Player. Now I know why. 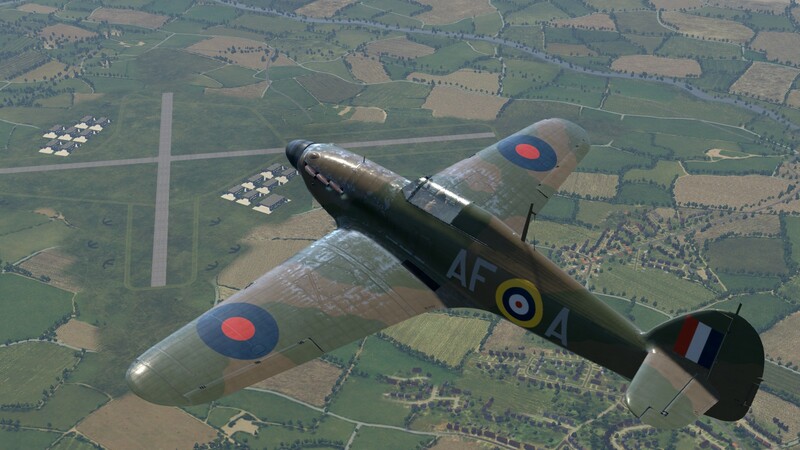 As a collection of nice WW2 planes with a limited air combat experience and a suitable map thrown in, it was perhaps worth the bargain bin price I paid for it - despite the painful reminder of what it could have been, every time I dip back in. As another player observed, Team Fusion’s plans – adding a Mediterranean theatre and aircraft – seem primarily designed – reasonably enough - to enhance the likely already-very-good Multi-Player experience. It remains to be seen, though, if CloD’s SP will ever get much better. 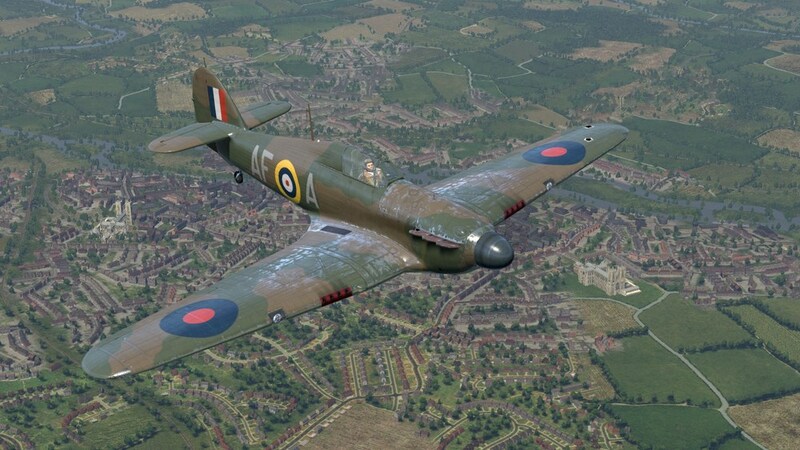 Battle of the Battle of Britain sims! 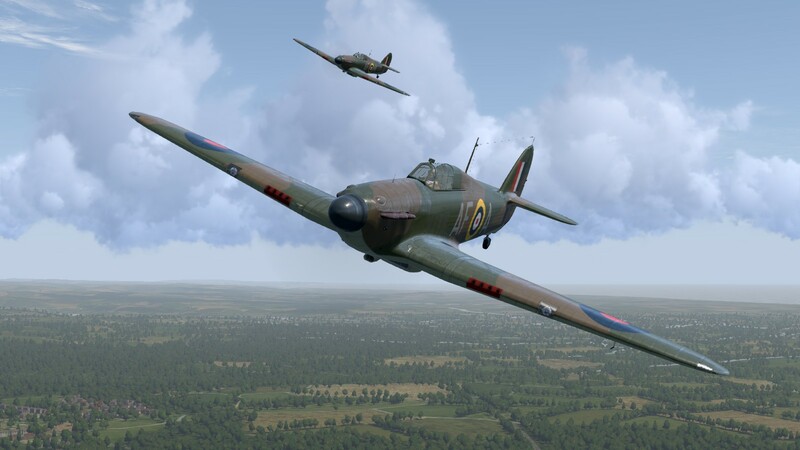 For one reason or another, I've found myself running single player RAF campaigns in parallel in these two Battle of Britain sims. As indeed you may have noticed, from recent mission reports. So I thought it might be moderately amusing to describe where I've got to in each, side by side. And share some more of my thoughts - for whatever they may be worth - on their respective merits, based now on a little more than first impressions. 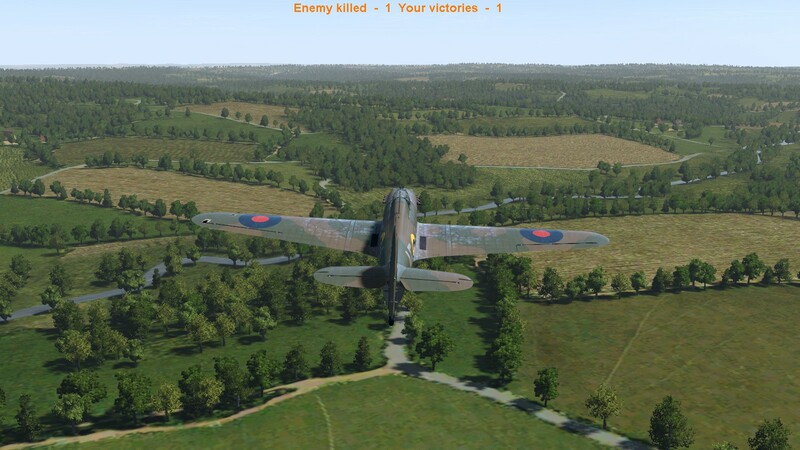 Starting with Battle of Britain II - Wings of Victory. It's the morning of 18th July 1940. Watching 'the plot' on the campaign map, I hear the a WAAF announce that a new raid is forming, over northern France. Time acceleration automatically slows from 300x to 20x and I watch the raid's marker nudge its way north, towards the Thames Estuary. As it comes, its size is revised upwards to seventy-plus and I can see at once that its likely target is either of two convoys, one off Felixstowe, the other further north near Great Yarmouth. Both are protected by a single fighter patrol, in squadron strength, put up by the campaign AI. The raid drifts past the Felixstowe convoy and I accept AI recommendations to scramble three squadrons to intercept it. Confirmation comes that Convoy Weasel, up off Great Yarmouth, is the likely target. In the meantime, the intercepting squadrons have been tracking across from the west and Douglas Bader's 242 Squadron is the first to report spotting the bandits. BoB2 asks me if I want to fly this mission and I accept, choosing to fly as Green 3, in one of the rearmost 3-plane vics in 242. The mission loads, and I find myself in Hurricane LE-L, at just over 16,000 feet, now heading nearly due south. Up ahead is the enemy - some of them, anyway. There look to be about thirty of them. They're not contrailing, so it's hard to work out their heading. You can just about make them out, right of top centre, in the pic below. From up ahead and to my left, Douglas Bader is saying something important on the blower, but I'm more interested in what the rest of the formation is now doing. Wings are waggling nervously and I'm suddenly concerned about keeping in formation. I'm also thinking, this was supposed to be seventy plus, where are the rest of the Germans? The answer isn't long in coming. Suddenly we are swamped by a shower of Messerschmitt 110s, which fall on us from above. I pull up and around in an effort to avoid being shot down, and maybe even come around onto their tails. In doing so, I realise I'm on my own and have lost the others - in such a situation, it seems to be each man for himself. I look up briefly to see if it's clear above me, before coming back down after the 110s. I get another shock. Waves of aircraft, which could only be Huns, are sailing past up there. The lower ones might be Ju88s; the paler ones above them could be more escorts. Others again, I can only see by their contrails. Crikey!!! If only the bloody Controller had told us to put on a bit more height, we would not be in this mess, bounced by 110s with the rest of the raid now having a clear run to the convoy. We can only hope that having stripped away some of the escorts, other squadrons will manage to get the bombers before they get the ships. Did anybody buy it in that first pass? No time to worry about that now. I roll over onto my back and go down, after the Messerschmitts. The gentlemen versus the players versus the Germans! Until a few days ago, having no interest in multiplayer, I had steered cleared of Cliffs of Dover. Until recently, I didn't have a system anywhere near the minimum spec of the current version on Steam, the Team Fusion 'Blitz Edition' (although it turns out to run smoothly, so far, at good-looking settings on a 1.5Gb GTX580, a lot less that the minimum 4Gb stated). So, how come this mission report? Well despite reports of poor AI, broken radio commands and limited single player content, I got it cheap enough to mitigate the limited satisfaction which I was resigned to expecting. First forays with my new toy confirmed the presence of several things I didn't like. Dispersion of effort into planes with little or no role in the Battle of Britain proper, which must be at the expense of something. Hedgerows replaced with 'tree-rows' and rather strong terrain colours (if not as cartoon-y as early versions). Over-weathered Hurricanes looking like ex-Japanese Army Airforce stock. Reasonable levels of radio traffic, but with some howlers like the boss being described as the Commander, instead of the Leader. Radio comms menu present but seemingly, much of it non-functional. Key commands a chore to set up, partly thanks to confusing duplicate labels in the settings table. Aircraft very hard to spot, without labels. 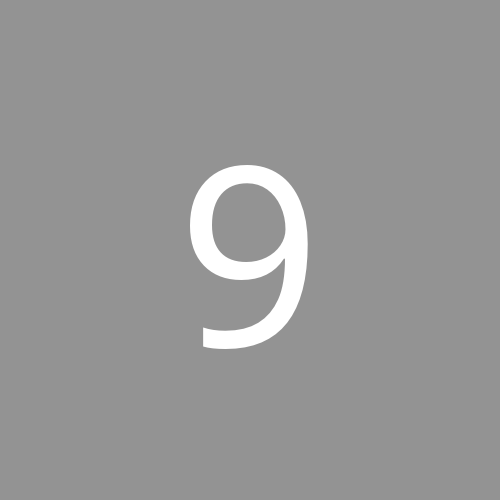 RAF squadron codes vary from unit to unit, but are in too round a font. And that was before finding out whether the doubtless delectable but totally silly Spitfire Girl was still lurking in the wings (pun intended). ...if you can get over some quirks, the visuals are pretty good, especially the cockpits, and as I said performance was surprisingly smooth. 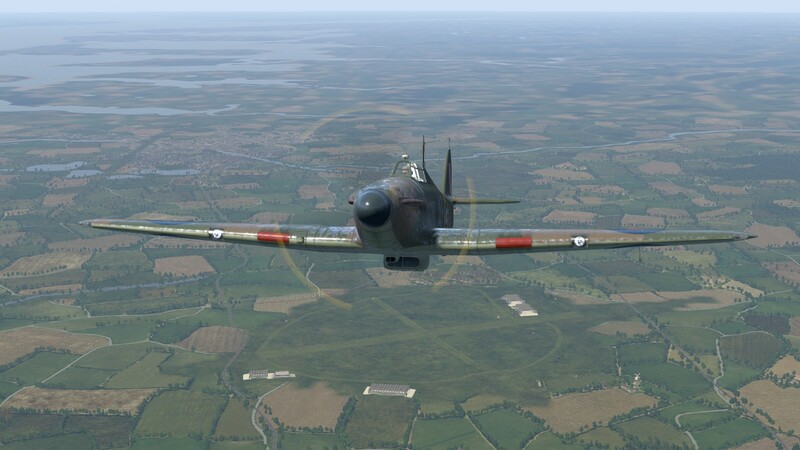 I tried a few of the included single missions for the RAF, and found them passable fun, again apart from some more quirks mentioned here. So I decided to have a look at the current CloD single-player campaign, despite not having every last key properly set up, and in particular not having worked out how CloD's padlock works (I use mouselook but don't like head tracking systems). 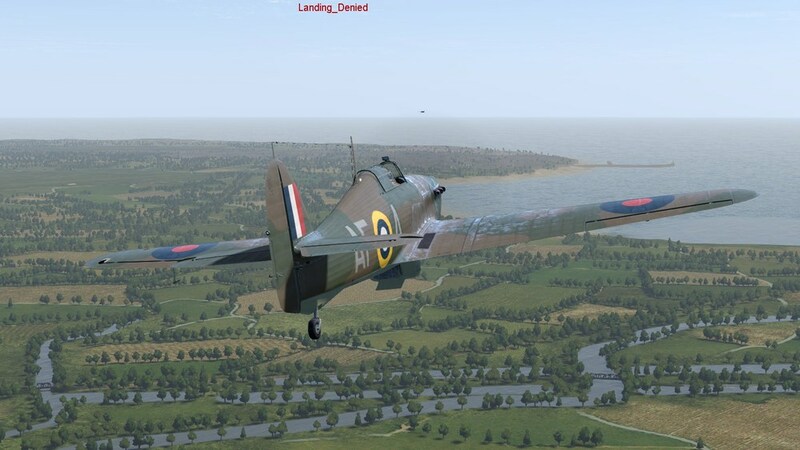 I soon found that the SP campaign is for an RAF fighter pilot, and apparently consists of a set of scripted missions, of unknown number so far. 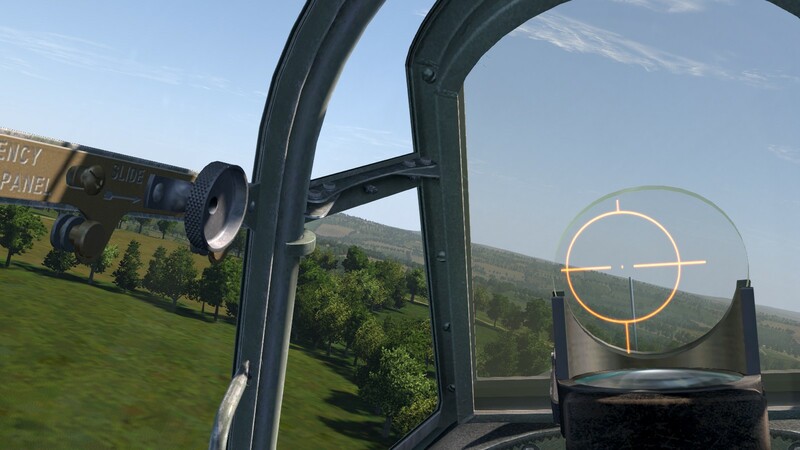 They have imaginatively-written briefings, which remind me of the best to be found in user-made campaigns for IL-2 '46, such as Blinding Sun and Faltspinman's Willi Jedermann series. Except that the briefings, creative though they be, are in some places bit twee - how do you say it in the US, 'cheesy'? The back-story is that you are a working class boy, or perhaps lower middle class, recently signed up in the RAF and posted to your Hurricane squadron, which is based at Tangmere, close to the Channel coast, at about the time the Battle of France ends. Your squadron is fictitious, but nicknamed the Fat Cats Squadron, because its pilots are basically rich kids. In this respect it sounds a bit like 501 Squadron, Royal Auxiliary Air Force, which really was like that, being known as 'the millionaire's squadron'. In this CloD equivalent, the first briefing puts you firmly in your place, socially-speaking. But you are taken under the wing of a friendly flight commander with a similar 'limited background' to yourself, also from the Manchester area, a 'northerner' not a proper chap from the jolly old Home Counties. 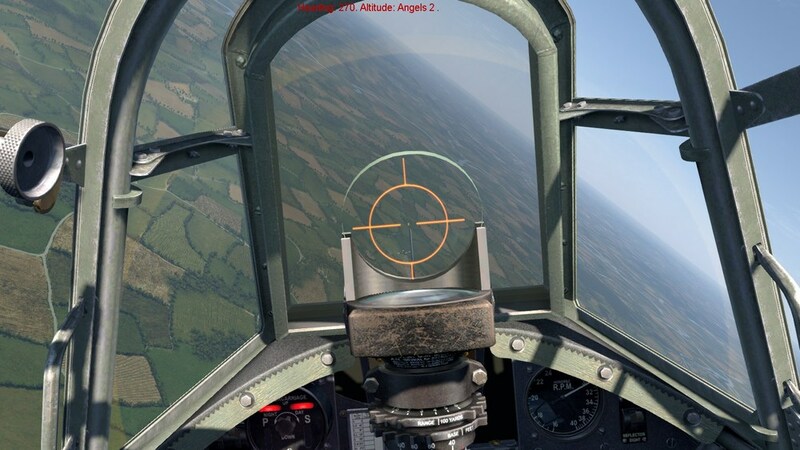 Your first mission with this less than friendly lot involves a scramble against a sudden, low-level raid by three Dornier 215 bombers which catches you on the ground, followed closely by a larger wave of maybe another nine. Second time up, you are scrambled to protect a Channel convoy against an attack by a large-ish bunch of Stukas, apparently unescorted. There are some screnies and brief notes on both missions in the post linked to above. Tolerably good, I found both, and the briefings link the missions together quite well. This report is from mission number three. The briefing begins with you and your friendly flight commander having a rather sad bitching session about the toffs who won't accept the likes of you and he into their circle, and ends when he breaks off to point out a damaged German bomber he's just spotted, apparently making for the coast on its own, in an effort to get back to France. 'Our planes are ready to go, let's go get him and orders be dammed!' is the gist of what he says next. So here we are. The mission has loaded and I'm sitting, engine running (no complex engine management mouseclick madness for me), in FC-A, with my new-found friend-for-life the flight commander in FC-M. The Fat Cats probably have personalised number plates on their MGs and Aston Martins, so I suppose it's no wonder they have their own fictional squadron code. The grass colours are really a bit dark but the airfield detail, as you can see, is fairly decent. It includes moving vehicles, notably some idiot racing around at about 50 MPH in a fifteen hundredweight truck or the like, fortunately well clear of any aircraft. Probably, it's some bored fat cat whose MG is in for a service. But where is the Hun? No-where to be seen, is the answer, so, slightly deflated, I wait for something to happen. Over the past 4 months the Storm of War server and website have undergone a number of important changes. 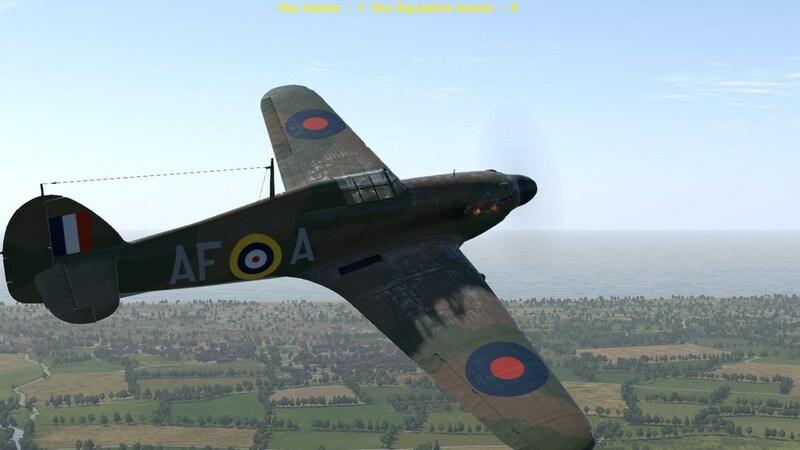 We welcome all Cliffs of Dover players to the server and the new website, particularly those players who are members of online Squadrons. We would also love to welcome back players who have not played Cliffs of Dover for a while, and who might be looking for something new in the multi-player environment. A new campaign is also being planned. More news on this will follow in time. Salute, Storm of War .